The old adage warns against judging books by their cover, but who can deny the effectiveness and appeal of well conceived cover art? Over the years as I’ve encountered various editions of Parker Tyler’s film writing I’ve been consistently struck by how consistently eye-catching the covers have been, and came across the idea of collecting them together on this site in a kind of archive. That project begins here. For a book published just two years after World War II, this cover exhibits a very contemporary sensibility–I can easily imagine this dust jacket gracing a 2018 new release. Unfortunately I have so far been unable to pinpoint the exact artist behind this striking design. I particularly like the technique of presenting the various faces of stars in negative, rending them at once recognizably human but also otherworldly, even phantasmal. The synopsis on the inside flap (included below) characterizes Tyler’s approach to film analysis as getting “under-the-skin,” so collaging x-ray-like images of the Hollywood stars he studies is an extremely clever way of visually signaling both his specific interests and even critical methodology. Also of note–and probably deserving of its own post–is that Magic and Myth of the Movies would later become beloved by Myra Breckinridge, the irrepressible heroine of Gore Vidal’s novel by the same name. As Myra writes in her diary, “Tyler’s vision (films are the unconscious expression of age-old human myths) is perhaps the only important critical insight this century has produced.” David Bordwell cautions that Vidal’s treatment of Tyler’s film writing in his novel should be taken as double-edged, “partly respectful, partly mocking” (112), but nonetheless this would undoubtedly be the edition Myra owns and refers to as she undertakes her late husband’s mission to write a definitive study of 1940’s Hollywood cinema. And to state in an author bio on a book about film that “he loves the movies, but… also hates them” is about as patently Parker Tyler as it gets. Bordwell, David. The Rhapsodes: How 1940s Critics Changed American Film Culture. University of Chicago Press, 2016. Vidal, Gore. Myra Breckinridge; & Myron. Penguin Books, 1997. Sometimes a detail that appears in the frame of a film instantly seizes our attention and momentarily crowds everything else out–a situation I encountered during a recent rewatch of the 1958 film adaptation of Auntie Mame. In the film’s second scene the young Patrick is introduced to his Aunt; she has misremembered her nephew’s date of arrival and he and his prim caretaker subsequently stumble into one of the lavish fêtes she regularly hosts at her extravagant Manhattan penthouse. Dumbstruck, the pair ogle the scene before them, and the film carefully showcases the wide range of eccentric individuals Auntie Mame associates with at the height of the hedonistic Roaring Twenties: a pianist playing ragtime while on his back, elderly Russian expatriates, raucous flappers, any number of “colorful” Asian and/or Middle Eastern figures in “traditional” garb–basically anyone conservative American audiences of the 1950s would likely find outré and/or politically suspect. As Mame careens through her rooms introducing her young nephew to anyone she encounters, she pauses momentarily to listen to the philosophical musings of one Acacius Page who is holding forth… to an indifferent room. But honestly I’m a bit hazy about the whole interaction because I was immediately distracted by the two other figures literally perched on the edge of the widescreen Technicolor frame: two older women, clearly coded as bulldaggers. I was equally mesmerized by their unimpressed glaring–they contemptuously amused by Acacius’s demagoguing–as by their chic fedoras, tailored pinstripes, and wide masculine lapels. There’s lots to unpack here–which I do in my thesis!–one of which is the tongue-in-cheek presentation of lesbian women who indeed have been historically treated as “mythological creatures” (consider the widely circulated legend that lesbianism was never illegal in Britain because Queen Victoria refused to believe such a thing existed). This isn’t a far cry from how they are presented in Auntie Mame, kooky “types” just as strange and “exotic” as a brownface maharajah with a monkey perched on his shoulder, intended to make the audience pop their eyes in wonder. And yet, problematic representation aside, I have to admit I was still glad to see them there at all. I also later realized I hadn’t registered that the same women appear earlier in the scene, foregrounded for several seconds during Patrick’s first glimpse of the party. Only this time they are smiling and sharing a laugh with another guest–a woman who presents as more femme, but on closer inspection sports neckwear that evokes a man’s string tie. And for the briefest of moments, these queer ladies seem more than mere “types” and seem to possess a life of their own. Ford, Charles Henri, and Parker Tyler. The Young and Evil. 1933 New York: Masquerade, 1996. Print. Of course, this is a question and topic familiar to anybody who has spent any amount of time reading through this blog, so it is perhaps no surprise that Eccentric Modernisms deals with exactly the same type of material featured here: the communities of transatlantic queer modernist artists that established social networks to support their artistic endeavors. Rather than launching a project of recuperation or attempting to “fix” established historical discourses, however, Latimer simply characterizes her book as “three case studies,” devoting a chapter each to Dix Portraits, a collaborative and lavishly produced publication which featured poems by Gertrude Stein and artwork by five of her then-current protégés, the mounting of the Stein and Virgil Thomson’s opera Four Saints in Three Acts in 1934, and View Magazine, the innovative art journal edited by Charles Henri Ford and Parker Tyler during the 1940’s. The decision to direct all focus solely on three specific examples of “collectively produced art publications, performances, and ephemera” proves to be an elegant one in its dexterity and concision, with Latimer providing evocative details and minutiae to tacitly state the case for her larger arguments. But why eccentric modernisms, as opposed to any number of other modifiers—queer, bad, pop, improper, impossible, cosmopolitan, and so many others—that been attached to modernism in recent years? Latimer admits that “the distinction between queer and eccentric may not matter,” though it serves as a useful differentiation from other synonyms, such as marginality (4). In a conversation that aired on Yale University Radio, I was interested to find out that Latimer had actually started out using “queer modernisms,” but ultimately decided that for this project “queer” wasn’t intended to be “necessarily attached to a specific notion of sexuality,” but was instead a “more capacious term.” The distinction makes sense within the context of Latimer’s overall argument, even as it also reaffirms why I continue to use “queer modernisms” in my own work (I do want to retain some kind of basis in sexual orientation and/or behavior). It was thrilling—and sometimes with a twinge of jealousy, I admit—to read through Latimer’s monograph, as she explores many of the exact same topics that I’m working through in my thesis: the difficulties of retrospectively applied terms and categories, the appeal of queer artistic networks, the motivation behind collaborative art making, the pleasures and perils of Gertrude Stein’s patronage, the nature of Charles Henri Ford and Parker Tyler’s artistic relationship, how and why so many things—even things which seem critically important—become “lost,” as well as the most effective strategies for recovering them. I suspect much that is here will find its way in one form or another in my own thesis, whether directly or conceptually. Latimer has been at the forefront of so much of the key scholarship of queer modernism (particularly her books dealing with lesbian expatriatism, the “modern woman,” and Stein’s enduring and multifaceted influence on modernism), and I suspect that Eccentric Modernisms is opening up space for a lot more work on these topics—which hopefully includes my own. Eccentric Modernisms is available for purchase through the University of California Press. Latimer, Tirza True. 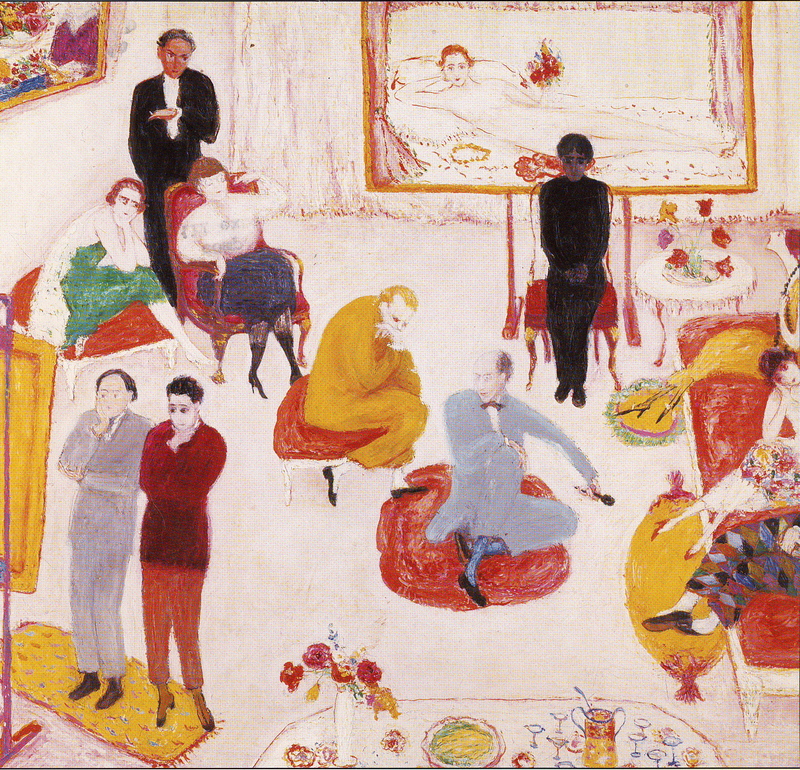 Eccentric Modernisms: Making Differences in the History of American Art. Berkeley: U of California, 2016. Print.